The birds are nesting and the allergies are in full swing. Welcome to Spring! If you're feeling inspired to clean out the garage, keep the energy going and consider doing some spring cleaning in your HR department. As is our focus, this post will mostly be related to hiring and screening employees. Benefits and other human resources functions could also be looked over or refreshed this time of year. It's good practice to keep all former employee records for at least 3 years. Depending on the state in which your business is operating, there may also be other requirements for employee record retention. If there is no litigation pending and the retention period has passed according to state and federal mandates, old employee files should be shredded or incinerated. If you don't have one already, this would be a great time to create a record retention policy for your HR department. The Department of Labor specifies Recordkeeping Requirements under the Fair Labor Standards Act. The EEOC has recordkeeping regulations as well. The Society for Human Resource Management also offers guidelines for creating an employer record retention policy. Your state, the IRS, ADA and other organizations may recommend guidelines as well. Did you know that the FCRA has released a new Summary of Rights notice? Employers are to have implemented this new notice as of last fall. Are your background check consent forms separate from your application for employment? If your city or state has banned the "criminal history" box, have you removed it from your applications? Does your employee handbook include new recommendations for workplace safety and reducing sexual harassment? If any changes have been made to your policies and procedures, these documents should be updated. A decision matrix is helpful to avoid hiring bias and discrimination when hiring. An interview scorecard, for instance, helps to weigh each candidate's answers to interview questions. 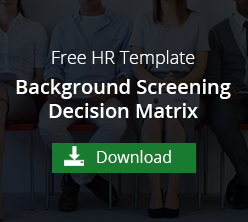 A background check decision matrix helps to determine which background checks are applicable per job and which criminal convictions automatically disqualify the applicant. If you've noticed some inconsistencies when hiring, or had to turn away a great applicant because of your current policy, you may need to make some updates to your background check policy. We are available to answer any questions related to background checks, screening policies and compliance. Let us know how we can help!